I promised an update on my two daughter's first cross country meet, and now the second one has occurred already. I guess it is past time for me to get writing and put it into words before the memory starts fading. Two weeks ago was the first official meet of the season, however it was not a typical 5k cross country distance. The Stage Races at River Green in Duluth are a series of 5 - 2 mile races, typically getting faster each stage till the 5th stage. They are all scored together so it is best for the coach to put their fastest runner in each stage, that is not too fast to blow away the stage so they would be better used in the faster stage. The boys and girls run these races together which also makes for an interesting dynamic. Ashlee ran in the 3rd stage of the JV races. She ran a great race and finished 5th overall to receive her first medal. She ran the 2 mile in 13:50 and was very proud of her finish as I was :) She ran the entire race very smart and learned a lot. She was nervous before the race, but not so bad since it was only 2 miles. Payton ran in the 5th and fastest stage of the Varsity races. She ran a great race as well and finished 3rd 4th overall and also medaled. Payton was the only one from her team running in this stage. She ran the 2 miles in 12:14. Payton actually came in 3rd place but we think that she stopped as soon as she crossed the line and the other girl was given the #3 card. Both the JV and Varsity teams got 3rd place in the Stage Races. 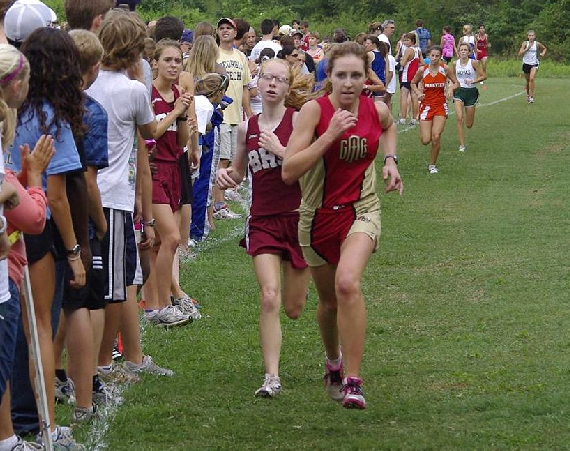 This past Saturday my daughters both ran in the Berry Invitational at Berry College in Berry, Georgia. This was the first official 5k race of the season which made many of the girls very nervous, especially the first year runners. The Varsity race ran at 10:30 and the JV ran at 12:00, but luckily it was a very pleasant day and not too hot. The team drove up the night before and had some issues with dinner that ended up making some of them sick. Payton was one of the lucky ones that got sick. She told me right before the race that she was not feeling well at all. She didn't have time for any last minute pit stops so she was going to be running the way she was. She was also very nervous since it was the first normal race of the season. Right at the beginning of the race there was a hugh pileup of around 50 girls right in front of us that some of our girls were lucky enough to be a part of. Payton started good, but was obviously fading throughout the race. She ended up finishing 26th overall and 3rd for her team in 20:23, just 3 seconds away from her current PR. As soon as she finished and I found her at the end she was feeling horrible and said she intentionally held back a little bit to keep from getting horribly sick while running. If she would have been feeling good she would have probably finished 1st for her team and brought home a big PR in the 19's, but there is always next time! 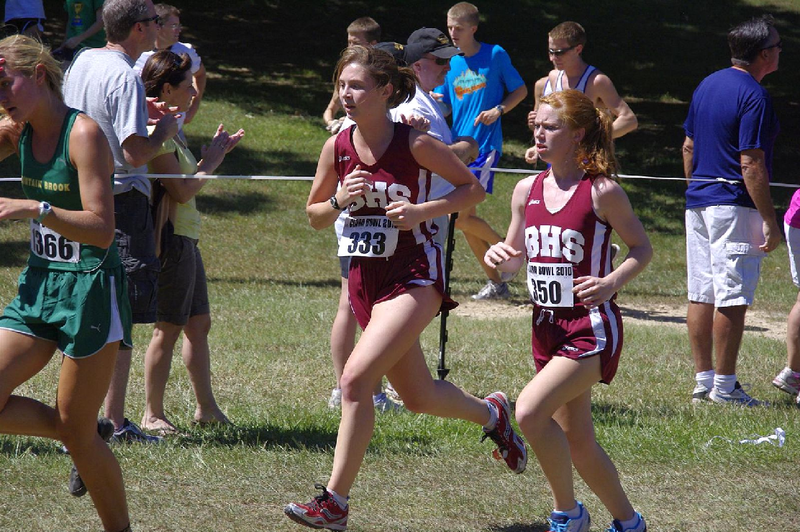 Ashlee was really really nervous before the race since she is a first year XC runner. She really needed to hit the little blue buildings before the race, but with the long lines it just wasn't an option. She ran hard and started well. She ran with one of her team-mates throughout the entire race and then just didn't have enough to keep up with her at the finish line. She ran an awesome first race and finished 14th overall and 9th for her team in 22:27 - a PR! Both the Varsity and JV teams came home Champions of the Berry Invitational - Congrats Brookwood Broncos!! 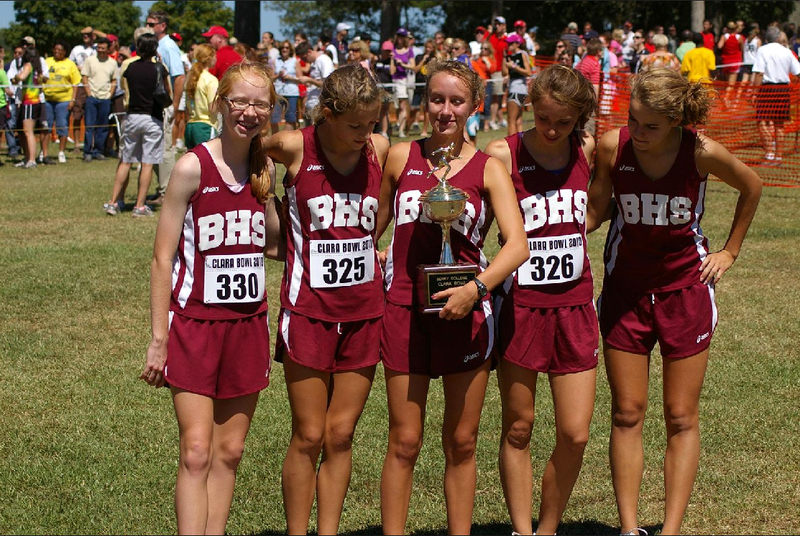 The Cross Country season has just begun, but will be over way too soon. I will try to keep up with their races on here since that is the true fun of running.... seeing how it affects those you love and how it changes their lives. Man, this brings back memories. Thanks for sharing. They did so awesome! And love the pics, too!